Deadly dangers of distracted driving. Showers turn to heavy rain. Highs in the 50s. 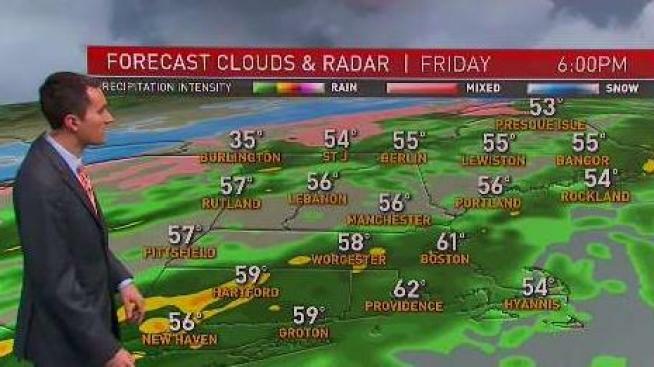 Friday night: Heavy rain, temperatures near 50. Breezy. The snow continues to melt today and there are areas of dense fog. High temperatures may challenge a record set only a year ago in the lower 60s. Rainfall is heavy at times first in western and northern New England this morning, spreading south and east during the afternoon. Due to rainfall and melting snow, there is a Flood Watch in effect for much of New England starting at 6 a.m. and ending Saturday afternoon. Not only do we have a flood watch, we also have winter storm warnings in effect for northern New England due to the rapid change from rain to freezing rain and snow tonight. Colder air will sweep south tomorrow as low-pressure tracks along our south coast. It is going to be a rough day for travel with snow and ice north, and rain perhaps ending is freezing rain and snow south by afternoon. Temperatures start the day near 50 degrees falling into the 20s, and teens north. For the Patriots game, perhaps some minor icing going on with the temperature in the 20s. The cold front does not go far offshore on Sunday, perhaps lingering close enough for snow showers in eastern New England, otherwise cold and dry with sunny breaks, high temperatures in the teens and 20s. Monday should be quiet with high-pressure coming in briefly, high temperatures in the teens and 20s once again. On Tuesday it's a challenging forecast as we're going to have a wave of low pressure on an arctic boundary coming across the Midwest and to New England. Low pressure will develop right overhead with the snow possibly heavy at times and maybe enough warm for rain and snow at the coast, changing to snow. Wednesday looks cold with snow ending. 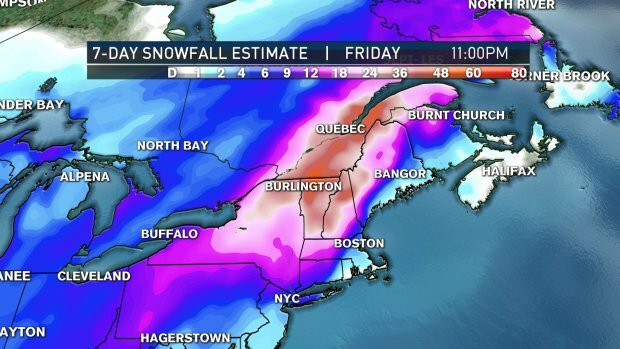 Some areas may have double-digit snowfall accumulations. Thursday looks cold and dry with a high temperature in the teens and 20s.